If you are hiring a recruitment agency to supply you with suitable candidates for different profiles in your company then you need to have an agreement in writing which includes all the terms and conditions between the employer and the recruitment agency to have complete clarity. So if you are planning to hire a professional recruitment agency, make sure you sign the agreement. 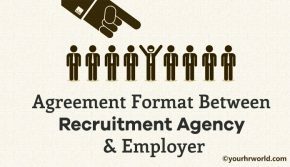 To help you with it, given below is a sample format of the agreement between employer and recruitment agency which you can use for creating your own. This Agreement of service is made between Zenith Technologies Pvt. Ltd. (hereafter referred to as “the Company”) of the one part, and KV Recruitment Consultants (hereinafter referred to as “the Agency”) of the other part. Effective Date: This Agreement will be effective from 26th March, 2017 and will be valid for duration of one year from the date of effectiveness. Termination: Either of the parties can terminate the Agreement for any reason, at any point in time upon one month’s written notice to the other party. Confidentiality: Both the parties shall maintain complete confidentiality of the information shared with each other. Scope of Services: Depending upon the requirements of candidates for different job profiles in the Company, the Agency will select suitable candidates. The identification of candidates will be done either by one or more than one means like in house database search or classified advertisement. Interviews of the screened candidates will be scheduled with the Company, once the Company has reviewed the shortlisted candidates, the resumes of whom will be sent after an in house assessment of skills, experience and qualifications required for a particular profile. Give one day induction to Agency team members to give them understanding of job requirement and process of interview. Provide the Agency with parameters for recruitment for each and every profile. Appoint an Executive for daily updates and coordination as designated authority for the process. Decide on one day of the week for feedback and discussion on forwarded candidates by the Agency. Share with the Agency staffing requirements in a quarterly rolling plan. Also provide in the start of every month job specification for staffing requirements. Communicate the Agency in case of candidate duplication within two working days. 8% CTC for Junior Level. 10% CTC for Middle Level. 12% of CTC for Senior level. After selection of the candidates, Company shall share with the Agency a breakup of compensation offered to the selected candidates for raising the invoice. In case some candidates are not selected, their CVs shall be returned to the Agency. Payments are to be made after deduction of the taxes, within duration of 30 days of the date of invoice once the candidate has joined the company, by cheque in favor of “KV Recruitment Consultants”. Any other work related communications like requests other than mentioned in agreement must be submitted in writing. The Company will not solicit or hire personnel of the Agency during the agreement period without mutual consent. Unable to fulfill the condition, Company will have to make the payment of six months cost of the person to the Agency. In case, the employee recruited via Agency leaves the job within period of three months of joining then the onus of recruiting a new candidate for the same position falls on Agency along with the incurred costs.